Oh yeah baby! It’s about race time! Corral B!! Can’t wait!! Eeeeekkkk….. you are going to ROCK it!!!!! Hope you have a restful taper! Yea I’m pumped about Corral B! Should be sweet! I’m in open (I’m SOOOOO slow) but I’m SO PUMPED for Chicago! 😀 😀 Congrats on Corral B! We were in open last year cause it was our first marathon. It was cool and we got there early to get to the front of the corral, but I really don’t think that was necessary. The bathroom lines were the only bummer so just make sure to get that stuff squared away as early as you can and don’t stress on the line up in the corral part too much. Good Luck to you and Rob!! Maybe I will see you in the sea of 45K+ runners. 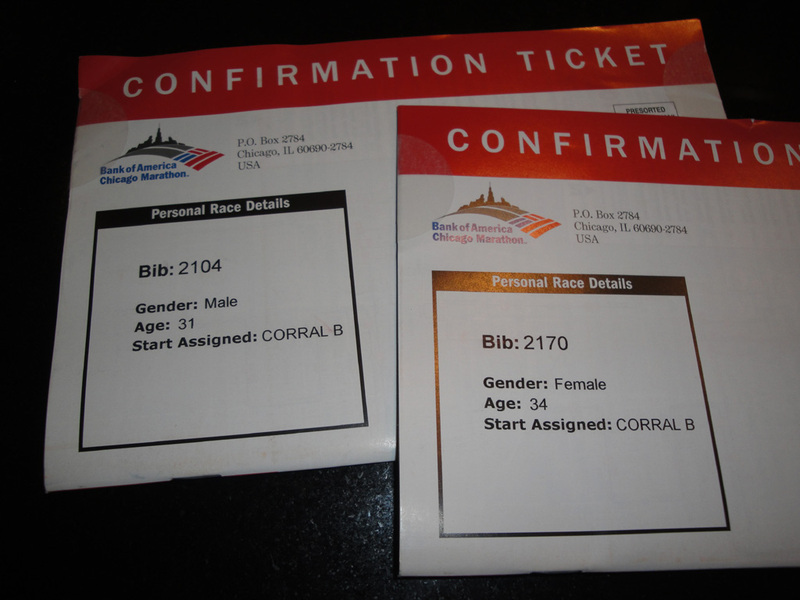 :0) I am in corral C and pretty pumped about it! Yay! Definitely say something if you see us and we will do the same. Are you decided on expo for Friday or Saturday? man, chicago is going to be awesome. im jealous. Yeah it will be awesome! You should consider it next year! i screamed a little when i got my chicago confirmations! can’t believe it’s so close. yay for chicago! That’s awesome! 😀 What Corral are you in? When you hitting up the expo? I think we are going Friday, but we could make it by Saturday too if others are wanting to meet up.